At Universal Orlando Resort be sure to visit Volcano Bay. 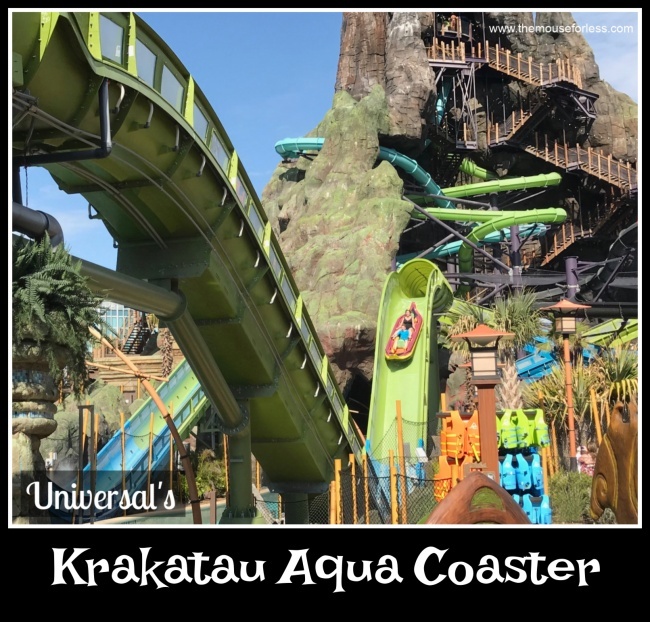 Here you can ride the famous Krakatau Aqua Coaster, just one of the many exhilarating attractions at Volcano Bay. On the Krakatau Aqua Coaster guests will board a 4 person canoe to tour the wonders of Krakatau. However, what does up must come down! The Aqua Coaster concludes with a large drop you will be sure to remember. Under 48″ (121.9cm) must be accompanied by a supervising companion. Weight Restrictions: Maximum 700 pounds (317kg) | Due to rider safety this ride may not accommodate all body shapes and sizes. Accessibility Information: Riders must be able to transfer from wheelchair (ECV) to canoe. Now at Universal Orlando Resort’s Volcano Bay, waiting in line is new and improved. All ride and attractions use the virtual line system with a special TapuTapu wristband. The TapuTapu will alert you when it is your turn to ride an attraction you’ve previously chosen. There is no cost to use the TapuTapu, however guests can use it to make purchases at Volcano Bay, view photos from My Universal Photos, and much more! While there is a large drop at the end of Krakatau Aqua Coaster it is designed for the whole family to love. It looks much scarier than it is. When guests stay at one of the Universal Orlando Resort hotels early park admission is included. Enjoy relaxation time at the Waturi Beach an hour before Volcano Bay opens to the public.